Is the Internet Killing Truth? An unintended and explosive outcome of the internet is only now emerging. Thanks to technology, information is free and ubiquitous. But discerning what is fact and what is fiction, has become a huge challenge. 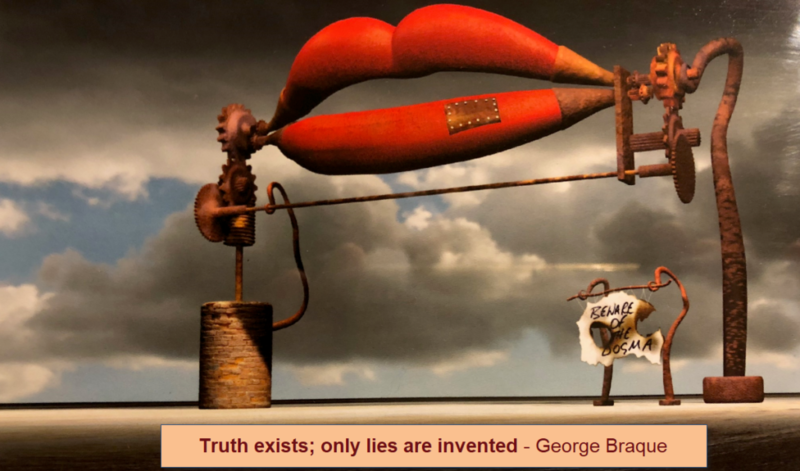 Today, we live in a world of “my truths” and “your truths,” and many other variations including “truth is not truth”. When attribution is no longer possible, truth dies. And when that happens, it has disastrous consequences for free societies. We are still in the early stages of understanding this fallout. But the impact has already been substantial. Earlier this year, the French proposed a new law that would allow the government to either delete ‘fake news’, or even block sites if needed. A decade ago, this would have been unthinkable in a free society because this type of action has always been the domain of authoritarian regimes. Yet, the French parliament passed the law in July 2018. (https://politi.co/2KOwDwG). In India, vigilante groups lynched innocent people after believing rumors on WhatsApp. This created a national outrage and the CEO of WhatsApp had to travel to India to meet with Indian officials and discuss attribution. The politicians in India demanded to know “Who sent those messages?” WhatsApp said that they could not answer that question (due to encryption) and they were subsequently annihilated in the press. Finally, WhatsApp had to pay for radio campaigns to tackle, yes, what else – Fake News! (https://bit.ly/2wlpP4H) Another Americanism went global, for all the wrong reasons. Many other countries now have laws against disinformation and more are considering them (https://bit.ly/2Auh2ln). These include diverse geographies like Germany, Brazil, Kenya, South Korea and Singapore etc. But is a government best positioned to arbitrate truth? Human history is replete with the fascists and autocrats who salted the truth to exploit people and, in the process, started wars that killed millions. In the USA, you would have to be living in a cave not to have seen the “Truth-vs-Fake News” drama playing out daily like an endless loop from a terrible movie. In August 2018 Pew found 78% of Americans say Democrats and Republicans disagree not only on “plans and policies” but on “basic facts”. The world is divided by the digital content we consume and choose to believe! Unlike 20 years ago, today we don’t need expensive media channels to get our word out. There are plenty of free platforms that enable us to reach out to millions in seconds. None of this leaves time to create the attribution that we had used to discern motive, intent and truth. In our fast-moving times there seems no time for the truth. Now reality has a million Popes – each telling us why they are the anointed ones – and why we should believe them. They have unlimited access to powerful free megaphones that stoke the us-vs-them mentality. Sadly, it doesn’t take much for tribalism to become the old, new norm. There is enough evidence that we are being manipulated by nation states who are purveyors of this new disinformation art form. According to one report, nearly 80% of the Twitter accounts that influenced the 2016 race, are still around (https://politi.co/2QuxyVH). Using low-cost influence campaigns to change the way people are thinking is the new normal. And it is very effective in undermining the key tenets of the social and political fabric. Without some intervention, it is hard to see how this gets better. There, unfortunately, the news gets worse. The sad truth is that there are no easy and effective solutions on the horizon. And yet, to prevent immense social and political upheaval – we have no choice but to find them and do so urgently. Recently a couple of alternatives have been considered. Self-regulation by technology companies has been in the news. This seems like a fool’s errand because the business model of such companies is antithetical to that kind of self-restraint. Last month, congress threatened Facebook, Twitter and Google executives with imposed regulation (https://usat.ly/2wQbOMx). Many believe such regulation is a matter of time. Eduardo Saverin, co-founder of Facebook, was recently quoted as saying that “social networks are heading for more regulation and change, as political pressures mount and users fragment into specialized interests”. Senator Warner (D-VA) acknowledged First Amendment problems in seeking to control what can and can’t be posted on social media platforms but said that these problems do have to be tackled. If we are looking for some magical intervention by the luddites who are our elective representatives, look no further. Sadly, many of them are of a generation where they are completely overwhelmed by the same technology that school children use with mastery. In the highly partisan dog-eat-dog atmosphere we find ourselves in, politicians are looking for every short-lived advantage they can find, even if it is truth that becomes a casualty in this zero-sum game. Fact checking and arriving at some way to an accepted truth is the new holy grail for technology companies, regulators and consumers of content. Many argue that the central problem is that the pace of change being brought about by technology exceeds our ability to counter its negative impact on society. There is merit to that hypothesis. Unfortunately, the pace of change is only going to accelerate in the future. Our ability to deal with that change, and the disruptions it causes, is crucial to the survival of many of the bulwarks of our society, including where truth lies. Our united survival may depend on it.